Recapitalization is a type of a corporate restructuring that aims to change a company’s capital structure. Usually, companies perform recapitalization to make their capital structureCapital StructureCapital Structure refers to the amount of debt and/or equity employed by a firm to fund its operations and finance its assets. The structure is typically expressed as a debt-to-equity or debt-to-capital ratio. Debt and equity capital are used to fund a business’ operations, capital expenditures, acquisitions, more stable or optimal. Recapitalization essentially involves exchanging one type of financing for another – debt for equity, or equity for debt. One example is when a company issues debtCost of DebtThe cost of debt is the return that a company provides to its debtholders and creditors. Cost of debt is used in WACC calculations for valuation analysis. Learn the formula and methods to calculate cost of debt for a company based on yield to maturity, tax rates, credit ratings, interest rates, coupons, and to buy back its equity shares. In a leveraged recapitalization, the company replaces part of its equity with additional debt and thereby changes its capital structure. One form of leveraged recapitalization might be a company issuing bonds to raise money. A company may resort to leveraged recapitalization if its share price declines. In this case, the company may issue debt securities to fund buying back its outstanding shares in the market. By reducing the number of outstanding sharesWeighted Average Shares OutstandingWeighted average shares outstanding refers to the number of shares of a company calculated after adjusting for changes in the share capital over a reporting period. The number of weighted average shares outstanding is used in calculating metrics such as Earnings per Share (EPS) on a company's financial statements, the company expects to increase the per share price. A leveraged buyout is a type of leveraged recapitalization that is initiated by an outside party. In a leveraged buyout, a company is purchased by an outside party by utilizing a significant amount of debt to meet the cost of acquisition and the company’s cash flows are used as collateral to secure and repay the debt obligations. During a leveraged buyout, the acquiring company’s balance sheet is loaded with additional debt used to purchase the target company. Subsequently, the capital structure of the target company is changed as the debt-to-equity ratio grows significantly under this type of buyout. In an equity recapitalization, a company issues new equity shares in order to raise money to be used to buy back debt securities. The move can benefit companies that have a high debt-to-equity ratio. 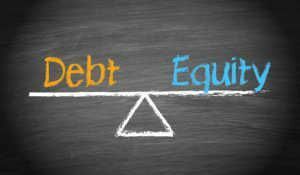 A high debt-to-equity ratio puts an additional burden on a company, as it must pay interest on its debt securities. Higher debt levels also increase a company’s risk level, making it less attractive to investors. Therefore, a company may seek to reduce its debt burden by issuing new equity shares and using the money raised from that to pay back a portion of its current debt. Nationalization is a special type of equity recapitalization when the government where the company is headquartered buys a sufficient number of the company’s shares to obtain a controlling interest. A government can use nationalization to save a company valuable to the country’s economy from bankruptcy. Another reason for a nationalization is to seize the illegally acquired assets of a company. However, nationalization is sometimes used by governments for the sole purpose of taking over the assets of a large, very profitable private company – usually a foreign company that has substantial business operations within the country. A substantial decline in its stock price is one reason for a company’s management to consider recapitalization. Under this scenario, the main goal is to prevent a further decline in the stock price. The company will issue debt to repurchase its shares and the supply-demand forces will push the stock price up. The excess of the debt over equity can result in high interest payments for the company and eventually place a significant financial burden on it. In this case, the company’s goal is to change its capital structure by issuing new equity and repurchasing part of its debt. Thus, the company will get rid of some interest payments, reduce its risk exposure, and improve its overall financial health. Recapitalization can be used as a strategy to prevent a hostile takeover by another company. The management of the target company may issue additional debt to make the company less attractive to potential acquirers. Companies facing the threat of bankruptcyBankruptcyBankruptcy is the legal status of a human or a non-human entity (a firm or a government agency) that is unable to repay its outstanding debts to creditors. Generally, it is initiated by the debtor and imposed by a court or companies that have already filed for bankruptcy can use recapitalization as a part of their reorganization strategy. A successful recapitalization is a key factor for an insolvent company to survive the process of the bankruptcy. Changes in the capital structure should satisfy all parties in the process, including the bankruptcy court, creditors, and investors. If successful, the company adopts a new capital structure that can help it continue its operations and avoid liquidation. CFI offers complete courses in financial analysis and modeling, along with hundreds of free articles designed to help you better understand all aspects of corporate financing and money management.